For the first time ever, the entire Justice League International saga, presented by master storytellers Keith Giffen, J.M. DeMatteis and Kevin Maguire, is collected in chronological order. In the wake of a world crisis, a new generation of the World’s Greatest Superheroes takes center stage. But it’s the most unlikely grouping of heroes you’ll ever see! Batman, Blue Beetle, Martian Manhunter, Guy Gardner, Black Canary, Mister Miracle, Doctor Fate, Booster Gold, Dr. Light, Shazam and more unite to form an all-new Justice League! 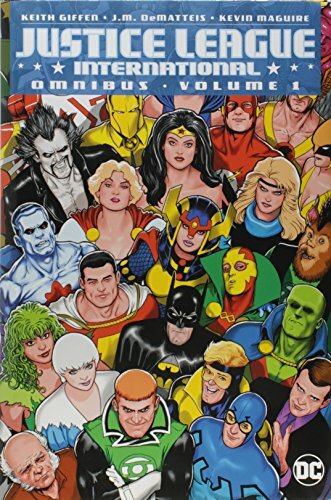 JUSTICE LEAGUE INTERNATIONAL OMNIBUS VOLUME ONE collects JUSTICE LEAGUE #1-6, JUSTICE LEAGUE INTERNATIONAL #7-25, JUSTIC LEAGUE AMERICA #26-30, JUSTICE LEAGUE ANNUAL #1, JUSTICE LEAGUE INTERNATIONAL ANNUAL #2-3, JUSTICE LEAGUE EUROPE #1-6 and SUICIDE SQUAD #13.